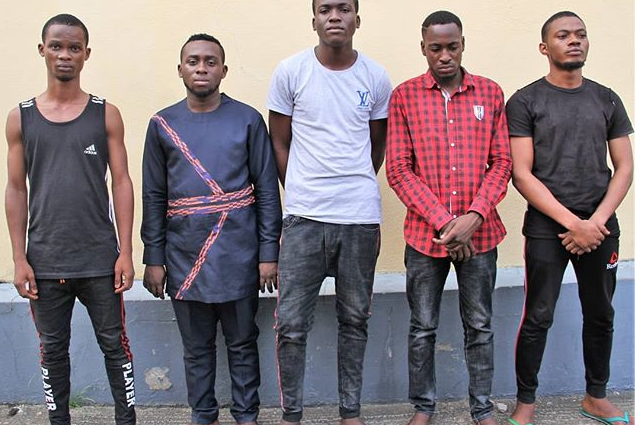 Operatives of EFCC, Ilorin Zonal Office have arrested 11 suspected internet fraudsters, following a tip-off and surveillance carried out around Agric Estate, Ilorin, Kwara State. The suspects, who were rounded up at about 11pm on February 4, 2019 include, Oluyomi Kadri, Adeseye Ogundele, Olasoji Alabi, Abdullahi Saliu, Abdullahi Ibrahim and Abolarin Kayode. Also arrested during the raid, were five ladies, Momoh Aminat, Momoh Nimota, Kelvin Blessing, Sunday Ruth and Oyinlola Awokunle. Among items recovered from them were land purchase documents, three exotic cars, laptops, internet modem, mobile phones and ATM cards. Some of them have already confessed to their involvement in various forms of internet fraud. They will be charged to court as soon as investigations are concluded.